Bristol - Moeen Ali said his six-laden one-day international century against West Indies at Bristol was simply a matter of deciding to "press the button and play a few shots". 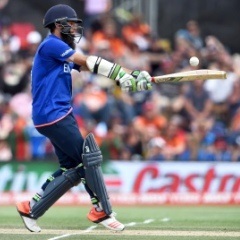 Ali struck England's second-fastest ODI hundred off just 53 balls, with his second fifty coming in a world record 12 deliveries. His 102 was the cornerstone of a total of 369 for nine - England's highest in ODIs against West Indies. Despite an impressive 94 from the returning Chris Gayle, it proved too much for the visitors to chase with England winning by the commanding margin of 124 runs on Sunday to go 2-0 up with two to play in this five-match series. Once Gayle was run out by Adil Rashid, West Indies' innings fell away with England fast bowler Liam Plunkett taking five for 52 - his maiden ODI five-for - as the tourists were dismissed for 245 with a whopping 65 balls, or more than 10 overs, to spare. Ali hit eight sixes and Gayle six in a match featuring 28 in total, with both left-handed batsmen taking advantage of the short straight boundaries at southwest county Gloucestershire's headquarters. "I just had a slog really, and everything just seemed to come off," all-rounder Ali, known for being an elegant stroke-player, told reporters. "I thought we'd got ourselves in, and it was time to press the button and play a few shots -- it's not a massive hit for six (here)." West Indies, who've now lost 14 of their last 15 completed ODIs against England, actually started impressively with the ball to restrict the home side to just 18 runs off the first five overs. "We just didn't finish off well," said a rueful West Indies captain Jason Holder, who won the toss and fielded. "They (England) bat deep. He (Ali) has played a special innings. I think we didn't execute our plans towards him. "It's a small ground and he backed himself to clear it." One consolation for West Indies was the innings of Gayle, long one of the world's leading limited-overs batsmen. He had marked his 38th birthday on Thursday by injuring his hamstring just before the toss while warming up and so missing a rain swept no-result in the second ODI at Trent Bridge. But the Jamaica opener was near his blistering best in Bristol. "It was very special," said Holder of the veteran's 78-ball innings, which also featured nine fours. "Not only did he get the start we wanted, he carried on and batted into the innings. "That was important, the longer he stays out there, the more England fear (losing)." Meanwhile Holder insisted there was a far more thoughtful side to Gayle than might be apparent from a player who revels in a 'cool' image with the self-created nickname of the 'Universe Boss'. "Chris is always a relaxed guy but, if you go to him, you'd be surprised by the amount of information you get from him," said Holder. "I've been privy to having a few chats with him in the last couple of days and it's been wonderful." This series has seen Gayle return to ODIs after a two-year dispute with Caribbean cricket chiefs and Barbados all-rounder Holder added: "He's shared a lot of information and helped me out a lot on the field. "It's really good to have a guy like him playing for you. Hopefully his body will allow to him carry on a lot longer." Holder was adamant that West Indies, the World Twenty20 champions, were "not too far off" becoming a competitive side in the 50-over game. "We just need to knuckle down a little more, especially when we bat," he explained ahead of Wednesday's fourth ODI at The Oval in London. "'Death' bowling has obviously been a cause for concern in the recent past and we really need to tighten up there as well."